I used to be a huge sweets person. I craved overly-processed chocolate, processed candy bars, cakes, donuts, and packaged cookies, on a daily basis. In fact, at one point in my life, during my late teen years, I would enjoy a Snickers every single day. Can you imagine what my health would currently be like if I had continued with that choice. Yikes! It’s taken years for my sweet tooth to finally calm down. I truly believe that an intentional lifestyle change, although the original goal wasn’t to kick my Snickers’ cravings, made all the difference. In 2008, we made the choice to start enjoying a lifestyle known as, “Real Food.” Slowly, over time, we swapped out the processed Oreos and candy bars for organic versions. And we learned to prepare and enjoy satisfying homemade meals, using whole ingredients and healthy fats. Something happened during this time–a change in our food cravings. As we moved away from the processed junk that we consumed as kids and teens, and started feeding our bodies with fresh, nourishing food, we stopped craving the junk. Maybe we realized just how bad the junk tastes compared to real food? Maybe we became more aware of the ingredients used to make the junk food? Or maybe our cravings actually changed as we fed our bodies nourishing ingredients? Now, don’t get me wrong. I’m still a huge fan of a good donut, and I love chocolate. But once we began to consistently feed our bodies nourishing calories from real ingredients, the intense daily cravings for things like processed chocolate and soda went away. Do we still enjoy chocolate and donuts? Oh yes! When they’re made with good ingredients, yes! But our bodies don’t crave the super sugary junk in the same way they used to. And when we do enjoy treats, we feel satisfied and full. As a parent, this is an important lesson: Our bodies will crave what we give them–whether that food helps us or harms us. I truly believe our bodies create habits around food, and so raising our children on good, nourishing food is important. Yes, there will be candy, birthday party cakes, Valentine’s treats, and a weekend cereal box, but my goal is for these foods to be treats–not daily, habit-forming cravings. I also want my kids to learn that when you want something sweet or chocolatey, it’s okay–treats can be made at home using really good ingredients. Our goal here at Live Simply, is to share good food, that’s made with good ingredients. Plain and simple. And here’s the beauty of good food: it’s usually simple food. Food that anyone can make, using ingredients that our bodies actually recognize as fuel (unlike that Snickers or soda). 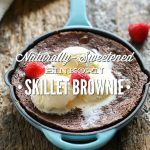 Today’s skillet brownie is exactly that kind of food: simple and good. This recipe is made with good ingredients: honey, cocoa, chocolate chips, and einkorn flour. I know a “healthier” (cringe) brownie recipe sounds like it might be more difficult to make than something that comes from a box, but that’s not the case. You don’t have to blend avocados or cook beans to make this better-for-you brownie. This recipe is incredibly simple to make. 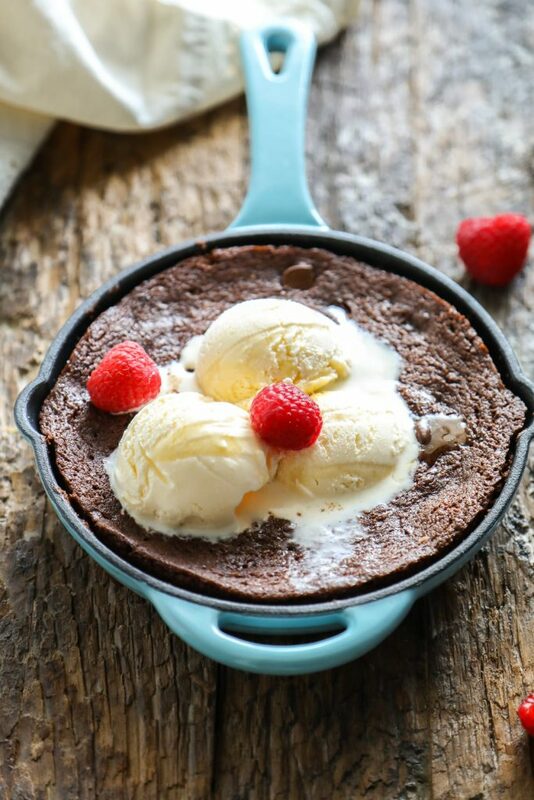 A simple skillet brownie made with better-for-you ingredients, like einkorn flour and honey. In a large mixing bowl, melt the butter. 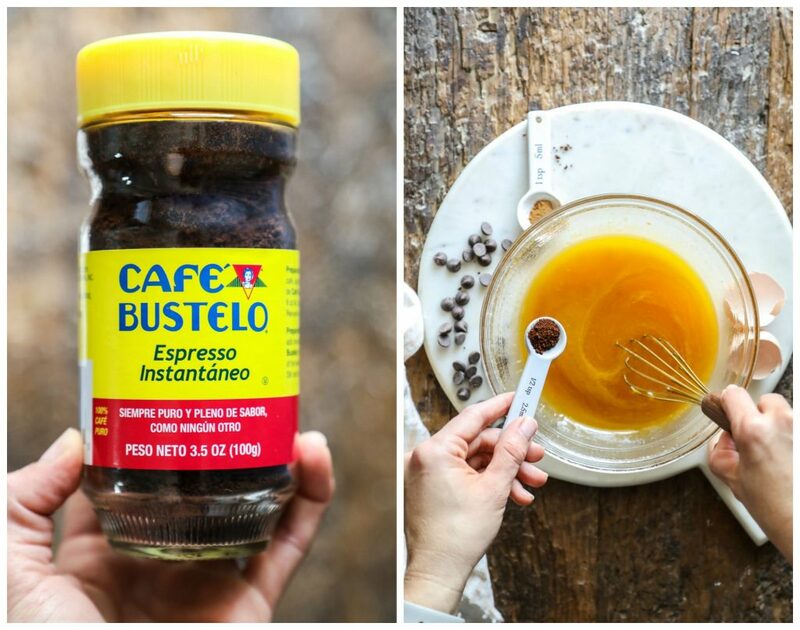 Let the butter cool and whisk in the honey, egg yolks, vanilla, and espresso powder. 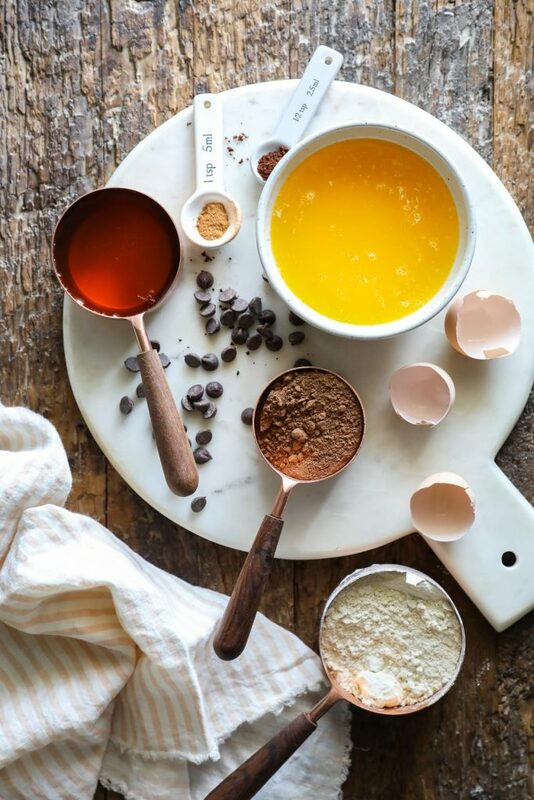 Whisk the dry ingredients into the wet ingredients: flour, cocoa, baking powder, salt, and cinnamon. If your flour is lumpy, try to whisk the lumps out before adding it to the wet ingredients. Stir well to combine the ingredients, and let the batter rest while you prepare the skillet(s). Allow the batter to sit and rest for about 10 minutes--you’ll notice it thickens. Butter a cast iron skillet (between 8-12 inches is ideal), or two small, individual-size cast iron skillets (pictured). Fold the chocolate chips into the batter, and pour the batter into the prepared skillet. 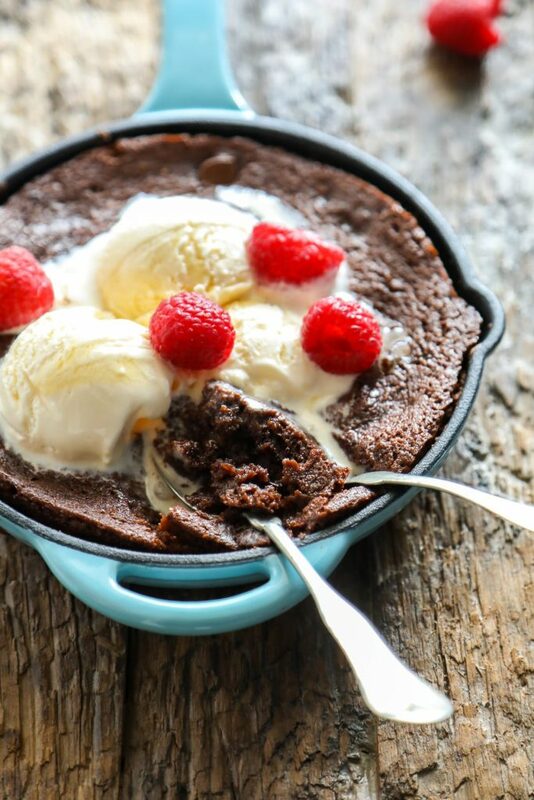 Bake the brownie for about 22-25 minutes, in an 8-12 inch skillet. Or about 20-22 minutes for smaller cast iron skillets. Bake until the center looks set (it will still wiggle a bit). A toothpick inserted into the center should have "fudgy" crumbs on it. Allow the brownie to rest for about 5-10 minutes. Serve the brownie warm with homemade whipped cream or ice cream. Dive in with a spoon, and enjoy! *If you don't want to use 12 tablespoons of butter, here's an alternative: 8 TB unsalted butter + ¼ cup coconut oil (both melted and cooled). 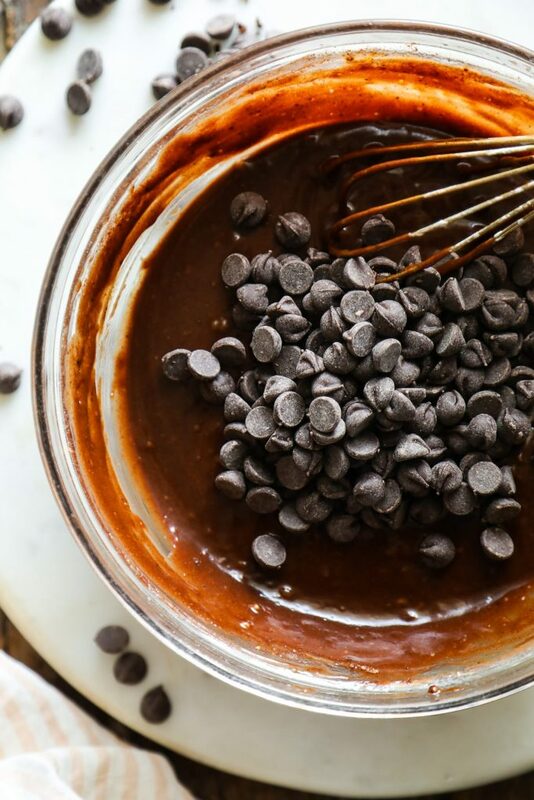 **If you're using regular chocolate chips, add a bit more than 1/2 cup (a heaping 1/2 cup). Chocolate chips usually contain sugar, if not they'd be too bitter. Look for the best chocolate chips you can find. I like Enjoy Life and Equal Exchange brands. 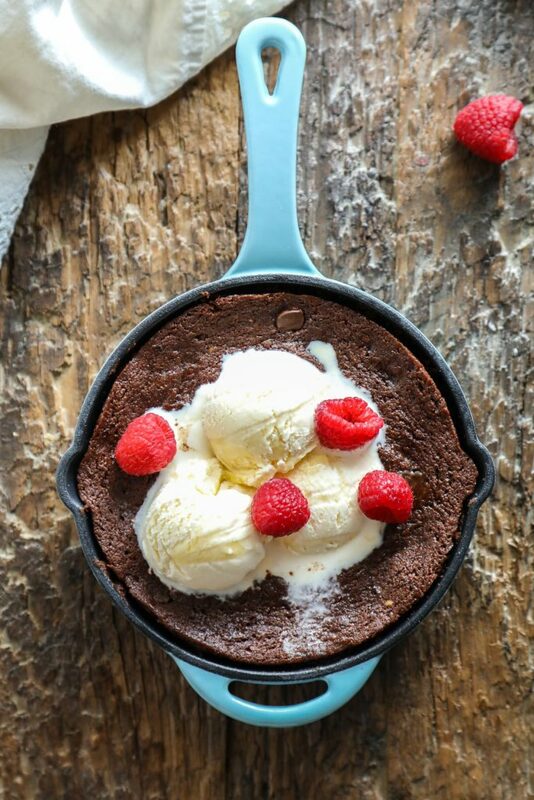 This brownie is meant to be enjoyed straight from the skillet. If you have leftovers, I recommend reheating pieces before serving them. This brownie is best when it's enjoyed warm. I don’t see anywhere how many it serves. Serves 1, right?!? Hey Katie, Oops! Lol, yep, one ;). This could serve 2-4 people, either in two small skillets, or one medium skillet. Thank you for letting me know about this! Updated. Out of curiosity, is this possible to make with wheat or white flour? Hey Krystal, I believe so. Here’s the general rule for using einkorn instead of white flour or white wheat flour, “Einkorn may be substituted cup for cup with regular whole wheat flour in some muffin, pancake, cakes and cookie recipes. However, sometimes, the amount of liquid in the recipe needs to be reduced by roughly 15-20%.” Source–Jovial. So, in this case, you may need to reduce the flour to about 1/2 cup. See how the batter looks at that point (it should be thick), and then add a tablespoon or two more of white or white whole wheat flour, if needed. Let me know how it goes! We made this tonight and everyone loved it!! Hey! Love your recipes with Einkorn Flour! Any advice for egg replacement on this recipe? Thank you, Rachel! So glad you’re loving the einkorn recipes. I would try a chia or flax egg replacement.